This article is about a Roman divinity. For the trans-Neptunian object, see 90482 Orcus. For other uses, see Orcus (disambiguation). 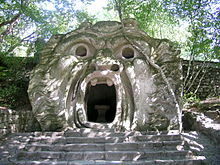 Orcus mouth in the Gardens of Bomarzo. Orcus (Latin: Orcus) was a god of the underworld, punisher of broken oaths in Italic and Roman mythology. As with Hades, the name of the god was also used for the underworld itself. In the later tradition, he was conflated with Dis Pater. Orcus was portrayed in paintings in Etruscan tombs as a hairy, bearded giant. A temple to Orcus may have existed on the Palatine Hill in Rome. It is likely that he was transliterated from the Greek daemon Horkos, the personification of Oaths and a son of Eris. Fresco of Odysseus (Uθuste) and the cyclops (Cuclu) in the Tomb of Orcus, Tarquinia, Italy. The origins of Orcus may have lain in Etruscan religion. 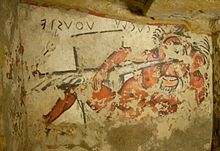 The so-called Tomb of Orcus, an Etruscan site at Tarquinia, is a misnomer, resulting from its first discoverers mistaking as Orcus a hairy, bearded giant that was actually a figure of a Cyclops. The Romans sometimes conflated Orcus with other gods such as Pluto, Hades, and Dis Pater, god of the land of the dead. The name "Orcus" seems to have been given to his evil and punishing side, as the god who tormented evildoers in the afterlife. Like the name Hades (or the Norse Hel, for that matter), "Orcus" could also mean the land of the dead. Orcus was chiefly worshipped in rural areas; he had no official cult in the cities. This remoteness allowed for him to survive in the countryside long after the more prevalent gods had ceased to be worshipped. He survived as a folk figure into the Middle Ages, and aspects of his worship were transmuted into the wild man festivals held in rural parts of Europe through modern times. Indeed, much of what is known about the celebrations associated with Orcus come from medieval sources. From Orcus' association with death and the underworld, his name came to be used for demons and other underworld monsters, particularly in Italian where orco refers to a kind of monster found in fairy-tales that feeds on human flesh. The French word ogre (appearing first in Charles Perrault's fairy-tales) may have come from variant forms of this word, orgo or ogro; in any case, the French ogre and the Italian orco are exactly the same sort of creature. An early example of an orco appears in Ludovico Ariosto's Orlando Furioso, as a bestial, blind, tusk-faced monster inspired by the Cyclops of the Odyssey; this orco should not be confused with the orca, a sea-monster also appearing in Ariosto. Note. The word used in translation of Q[uenya] urko, S[indarin] orch, is Orc. But that is because of the similarity of the ancient English word orc, 'evil spirit or bogey', to the Elvish words. There is possibly no connexion between them. The English word is now generally supposed to be derived from Latin Orcus. Orc I derived from Anglo-Saxon, a word meaning demon, usually supposed to be derived from the Latin Orcus—Hell. But I doubt this, though the matter is too involved to set out here. From this use, countless other fantasy games and works of fiction have borrowed the concept of the orc. The name "Orcus" appears in the Dungeons & Dragons role-playing game as Orcus, Prince of the Undead. Orcus appears as a character in Christopher Moore's A Dirty Job. The Kuiper belt object 90482 Orcus is named after Orcus. This was because Orcus was sometimes considered to be another name for Pluto, and also because Pluto and 90482 Orcus are both plutinos. ^ a b c Bernheimer, p. 43. ^ "This webpage is unavailable | Claranet Soho". Home.clara.net. Archived from the original on 2004-01-13. Retrieved 2014-02-18. Wikimedia Commons has media related to Tomba dell’Orco (Tarquinia).